Make the best of your film location listing. Review and take the time to properly display your property. When listing your property to host production success is to assure you provide easy and timely contact information. Production and location scouts are generally on time constraints and need to be able to talk to someone asap, in order to get more information or to see the property. Since locations can be a critical component when filming or photographing scenes, it needs to be nailed down . There is a lot in the production process that depends on the location, so making it easy for production personnel to talk to you to increases the chance of getting selected. Difficultly in contacting owners, hinders production opportunities drastically for them, there may never be a second call from this project because they found someone they could talk to. Our staff reviews all locations in our database for typos. We see incomplete email addresses and phone numbers, owners that have not checked to make sure their inquiry form goes to their inbox and not the junk email folder. If you don’t assure communication, the project will move on to other options. Once you list your property in the database, go back and view it, check for typos, check email and phone number, make sure you are getting a copy of the online inquiry form going to your email inbox. Read your location details in listing and add more details as you recall them. You can manage your listing 24/7 online updates. Add photos to your production location rental profile that are clear and crisp. Don’t include photos of people in your property shots. Show your property inside and out. A photo of the front is good, the back and interiors of rooms such as kitchens, bedrooms, bathrooms. hallways, and stairs. When taking pictures, step back and shoot the entire area so it can be seen. showing exits, balconies and views in the background. DO NOT put on your profile closeup pictures of beds, sinks or artwork unless it is a unique feature that would interest them. Get the entire area. Scouts are generally looking at rooms, entrances and exits to see if the scene(s) to be shot will fit the dressing, script and production crew needs. An overview of the spaces is the best for display on your location rental listing. Another important addition to your location rental listing is to be sure to add LOTS & LOTS of details about your property. Describe the interior and exterior, square footage, any special rooms, basements, attics, family rooms, backyards, offices, kitchen and bathrooms. Include information such as the back yard. Include info of views from the front and back of your property. The more they know about the venue, the better they can determine if it will fit their needs. Your location profile is the introduction to film crews. Be sure to check it and make sure it is the best display of your location offering as possible. 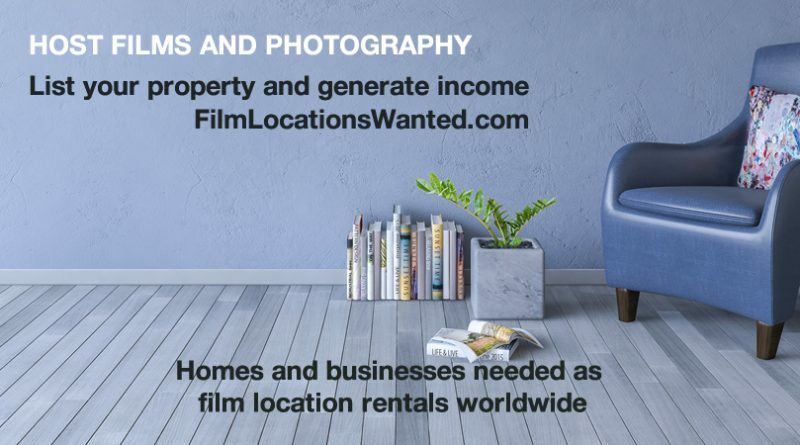 Click here to list your home or business as a film or photography location rental. If you need assistance, please contact us. We are here to help. Contact Us.